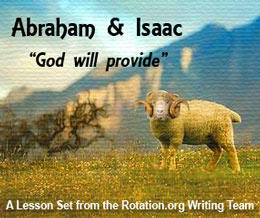 Welcome to the Writing Team's Abraham and Isaac Lesson Set. 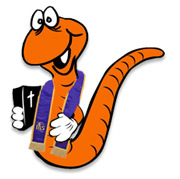 The Lesson Summary and Bible Background pages are open to the public. The Writing Team's lesson plans are open to Supporting Members only. Become a Supporting Member today! Don't forget to check out our public Abraham forum as well. God Will Provide is a special lesson set from the Rotation.org Writing Team about an important Bible story. Everyone is welcome to read the lesson plan summaries and background for this "WT" set. Supporting Members have access to the special lesson plans in this set. View the Writing Team's Lesson Menu and learn more about what makes these Supporting Member lessons extra special. The Writing Team's lesson sets are in addition the thousands of public lessons and ideas here at Rotation.org. Become a Supporting Member now.